Only one copy of the Life of St Deiniol is known, which was in Latin and transcribed from an ancient manuscript by Sir Thomas Williams of Trefriw in 1602. There is a poem written in 1527 by Sir David Trevor, parson of Llanallgo, which gives a few extra details. The first mention of him comes from the 9th century Irish Martyrology of Tallaght where he is one of only three Welsh saints to be included showing the importance of his foundations in the pre-Viking period. Deiniol was the son of Abbot Dunawd Fwr or Dinothus, son of Pabo Post Prydyn, by Dwywai, daughter of Llenog. He is often called Deiniol Wyn, the blessed. He was the brother of Cynwyl and Gwarthan, and the father of Deiniolen. His wife’s name is not recorded. When Pabo and his family lost their territories in the North, they retired to Wales where they received the protection of the king of Powys who granted them land and whose son and successor married Pabo’s daughter, Arddun. His son, Dunawd, embraced the religious life and founded the monastery at Bangor-is-y-coed on the Dee. Deiniol soon left Powys for Gwynedd where he founded the monastery of Bangor under the patronage of Maelgwn Gwynedd who endowed it with lands and privileges, later raising it to the rank of the official seat of a bishop, sharing a common boundary with the principality of Gwynedd. Deiniol spent the remainder of his days here as Abbot and Bishop. During this time, he attended the Synod of Brefi in c.545 with St. Dyfrig and St. David when the Church was discussing penitential regulations. Sir David Trevor describes Deiniol as one of the seven blessed cousins who had spent part of his early life as a hermit "on the arm of Pembrokeshire" but was called to be a bishop despite deficiencies in his formal education. He is accredited with many miracles. Once, a woman from Caerwys who had taken poison and was beyond the help of physicians, drank water from his well and threw up numberless worms. In another account, she came to his church on the mountain and drank water from the well and vomited three horrible worms. His cult in North Wales was quite extensive although there are not many churches dedicated to him. 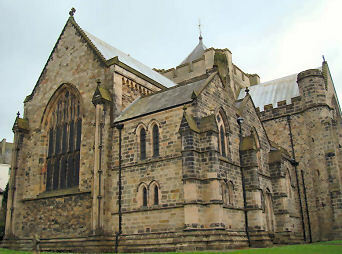 The cathedral church of Bangor is dedicated to him and he is the patron saint of the diocese. Norden’s Survey of 1620 records a field called Cae Fynnon Daniel at Bangor-is-y-coed. The Welsh Prayerbook gives his feast day as September 11th but older Welsh calendars give his feast day as December 10th and a fair was traditionally held at Llanuwchllyn on 22nd December. At Hawarden, a fair was held on 10th December or 21st. St. Deiniol’s Ash Farm and St. Deiniol’s Residential Library are also found in Hawarden. The latter was established by William Ewart Gladstone in 1889 for the promotion of "divine learning". The Church of Marchwiel is dedicated to Deiniol and a tenement of fifteen acres is named Tyddyn Daniel, purchased in 1626 for "the repair and use of the Church." In South Wales, Llanddeiniol or Carrog in Cardiganshire and a chapel a mile south of Pembroke, once belonging to Monkton Priory, bear his name. The Church of Itton in Monmouthshire, formerly known as Llanddeiniol, is dedicated to him as is Llangarran in Herefordshire. In Penally, Pembrokeshire, there is a holy well of St. Deiniol and another in the parish of Penbryn, Cardiganshire. According to the Annales Cambriae, the Latin language Welsh annals, St. Deiniol died in 584 and was buried on Bardsey Island. It appears that Deiniol was in Brittany for a while as he is venerated there as Saint Denoual. There are dedications to him at a church near Matignon in Côtes du Nord, at Plangenoual near Plénef in the same ‘départment’ and at La Harmoye, where Gildas had a settlement. A statue of Saint Deiniol habited as a monk stood in the hamlet of S. Denoual near Matignon but was destroyed in the revolution of 1793.